“Heather Haley-Poet.” How did that happen? Certainly I didn’t plan to become a poet. I didn’t grow up thinking, when I grow up I’m going to be a poet. But in essence, it is who I am. I wasn’t exposed to literature. My father read Popular Mechanics and my mother, True Confessions. Though, being an Irish queen of blarney, Corona could spin a mean yarn. I didn’t get a degree. I dropped out of university and ran away to join the punk rock circus; sang, wrote songs and poetry which I performed in coffee houses and nightclubs. 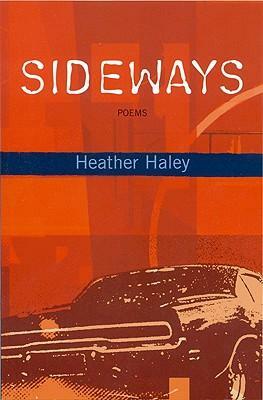 When I returned to Canada, in a fluky way, published my first collection, Sideways, with Anvil Press. Three Blocks West of Wonderland came out with Ekstasis Editions in 2009 so I’m not exactly prolific, though never cease writing. In a haphazard way, I’m becoming “widely anthologized;” Verse Map of Vancouver (Anvil), Rocksalt: An Anthology of Contemporary BC Poetry (Mother Tongue Publishing), Alive at the Center (Ooligan Press), FORCE Field: 77 Women Poets of British Columbia (Mother Tongue Publishing), The Wild Weathers; a gathering of love poems (Caitlin Press), The SpokenWord WorkBook (Banff Centre Press), Where the Nights are Twice as Long: Love Letters of Canadian Poets (Goose Lane Editions), The Other 23 1/2 Hours, What Your MFA Didn’t Teach You (Wolsak & Wynn), and the forthcoming Simon Fraser University’s Lunch Poems Anthology. Is my approach irresponsible or irreverent? Due to a bad attitude perhaps and Sideways might be entirely appropriate. I’ve worked in many genres; journalism/reviewer, non-fiction/blog, prose/novel and written several screenplays. I always go back to poetry. Or, come back to poetry. Recently I completed a rough draft of my latest manuscript, Detective Work. Why? It’s in me, verse. And I have no idea how it got there. Spooned flies out of yogurt. Dislodged ants from the toaster. Last house on Husband Rd.